We are one of the affluent organizations actively engaged in offering an excellent quality Shell & Tube Heat Exchangers that are highly suitable in varied automotive industries for recovering heat from gases and steams. The offered heat exchangers are made up of premium quality components and the latest technology. Our offered heat exchangers are tested at our well-equipped lab in accordance with set standards of quality by our experienced professionals. Provided heat exchangers are available in numerous specifications as per clients need. Baffles on shell side ensure improved heat transfer by increased turbulance. By keeping track with market development, we are involved in providing superior quality Glass Shell & Tube Heat Exchanger to our customers. 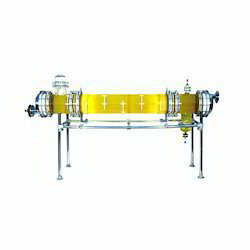 The offered heat exchanger is manufactured by our skilled professionals as per set market standards of quality using superb grade glass and high end techniques. Provided heat exchanger is strictly tested by our quality experts on predefined quality parameters. Moreover, we provide this heat exchanger which is available in different shapes and sizes. Universal corrosion resistance an excellent alternative to expensive MOCs like graphite, hastelloy, copper titanium, tantalum and other exotic metals. Excellent heat transfer as fouling does not occur on smooth glass surfaces. Easy replacement of tubes for repair and cleaning. Available in wide range of HTAs. Ease of installation due to light weight. Suitable for applications where large HTAs are required in limited space. The overall heat transfer coefficient in shell and tube heat exchanger is about 3 times higher than in coil type heat exchanger. The pressure drop in shell and tube heat exchanger is minimal compared to 2-3 kg/cm2 in coil side of coil type heat exchanger. For requirement of higher heat transfer areas shell and tube heat exchanger is the only alternative. 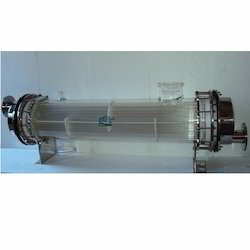 Our highly talented team is offering Glass Heat Exchanger of fine quality. They are used in various laboratories to perform various duties that include evaporation, condensation, heating and cooling. 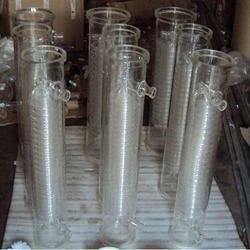 The glass tubes are sealed into PTFE tube that permits easy replacement and cleaning. Additionally, the overall heat transfer in this exchanger is about three times greater than coil type heat exchangers. The glass tubes are sealed individually into PTFE tube sheet with special PTFE sockets and packing. This unique ferrule type sealing arrangement permits easy replacement and cleaning of tubes. Baffles on shell side ensure improved heat transfer by increased turbulance. Being the leaders in the industry, we present Industrial Heat Exchangers to our clients. These heat exchangers are available in coil type and shell and tube type and are highly appreciated for its durability and long life. They are carried out in borosilicate glass because it is smooth and every process can be easily viewed through it. In addition to this, it is presented at the best rates in the market. Looking for Glass Heat Exchanger ?